The Ruffy Weekend Walkers were recently very privileged to be taken on walk down the little known Baronga Creek , a tributary of the Creightons Creek by Barry, Ann and Natalie. We were shown some amazingly tall tree ferns estimated to be nearly 10 metres tall. 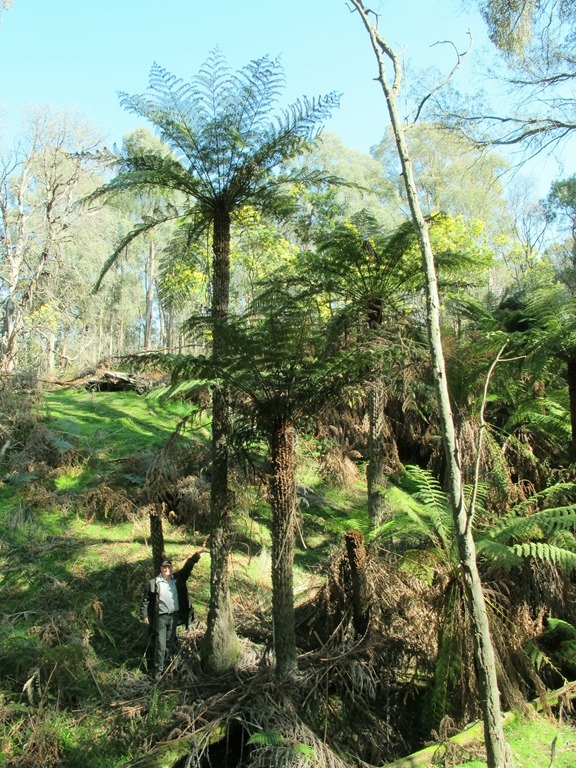 ( Neil is standing beside one in the photograph to give an idea of the scale).These tree ferns grow at a rate of about 3 metres every one hundred years. So if you do the maths these plants were growing way before Captain Cook set out to discover Australia , Canada was still a French Colony and Handel was at the top of the music charts . Previous Previous post: Painted Ladies. The first butterflies of the season.